Haley Bond, Lauren Marcus, Eva Kantor, and Ali Gordon. Photo by Tim Fort. Lauren Marcus. Photo by Tim Fort. Haley Bond, Ali Gordon, Eva Kantor, and Lauren Marcus. Photo by Tim Fort. If you’re looking for a toe-tapping, fun- and laugh-filled evening at the theater, you’ll find it at The Weston Theatre’s Second Stage. 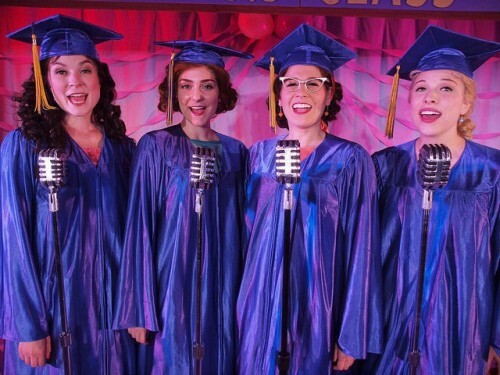 The Marvelous Wonderettes: Caps & Gown. It is what is called a juke-box musical entailing previously released popular songs as its score. 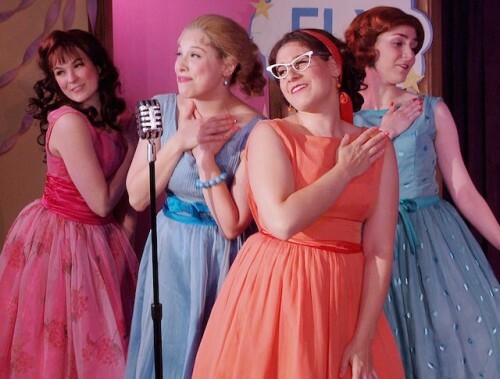 In this case, songs from the ’50s and ’60s are strung together to highlight a loose, goofily entertaining storyline featuring a group of four high school girl singers. The first act is graduation day at fictional Springfield High in 1958 with songs about the school year and the upcoming summer vacation. It includes such classics as Rock Around the Clock, At the Hop, It’s Only Make Believe (What a) Wonderful World, and Sealed With a Kiss, plus some more obscure but equally entertaining tunes such as Mr. Touchdown, U.S.A, You Gotta Be A Football Hero, Teacher, Teacher, and, of course, Graduation Day. This act also introduces and establishes the archetypal high school best friends that make up the girl group: the pretty, self-absorbed one (Cindy Lou), the put-upon class clown (Betty Jean), the smart, bossy one (Missy), and the exuberant, ditzy blond (Suzy). Act Two is 10 years later (1968) with the Marvelous Wonderettes reunited at Missy’s wedding. Though much has changed, much has stayed the same. The tunes of the ’60s include Hooked On A Feeling, Don’t Mess With Bill, Wishin’ & Hopin’, You Keep Me Hangin’ On, and River Deep, Mountain High. 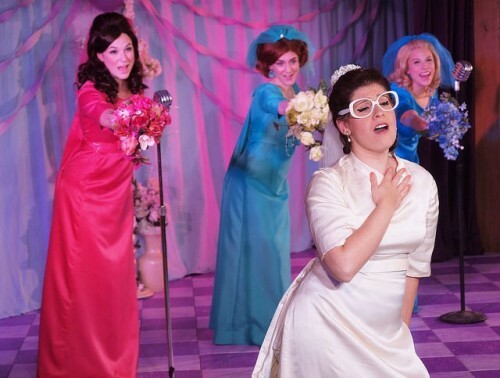 The Marvelous Wonderettes: Caps & Gowns is basically a family-friendly burlesque, a humorous exaggeration of the teen years and loves of four young women. This production jumps in with both feet, pushing the era and the caricatures to their tasteful limits. It’s impossible to single any one actress in this very tight ensemble. Each is completely committed to character and to the group. The music is a delight, from the piano accompaniment to the pop arrangements, and tight harmonies. Each of the performers has a number of solos and is backed up, doo-wop style, by the other three. Of special note is the choreography by Terrie Robinson. She captures both eras beautifully, down to shoulder shrugs, wrist twists, head tilts, and corny synchronized hand and arm movements. There is never a loose or unfocussed movement. The charming and multi-color costumes (by Collette Benoit) and simple colorful set, with cabaret tables among the audience, add to the playful mood of the evening. Even the lighting (by Travis McHale) gets into the act as Richie, Suzy’s boyfriend, signals his support with furiously flashing approval. The cohesion of the entire production and the consistent and hilarious use of comic bits by all the characters throughout the show must be credited to director, Tim Fort. Uniting a cast and crew, as he has done with this delightful production is no small accomplishment. 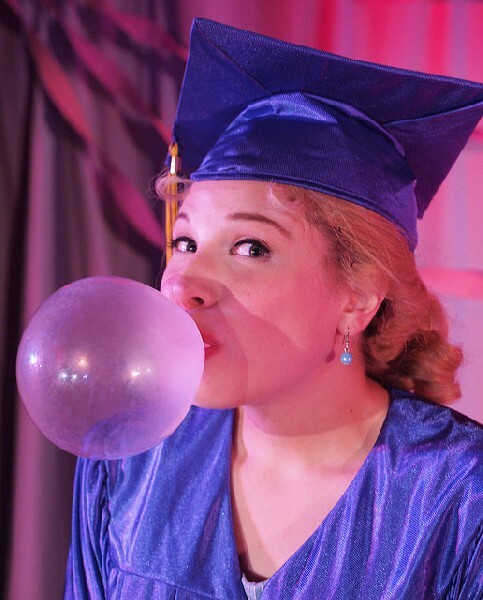 The Weston’s Second Stage is a small house, which is perfect for this intimate and friendly production, but get your reservations now because when word gets out about how much fun The Marvelous Wonderettes: Caps & Gowns is, it’s bound to sell out quickly.